Google deal: Save over 40% on Google Home smart speakers | What Hi-Fi? You may have seen big Echo smart speaker reductions in Amazon's current spring sale, but there's also good news for those who favour Google's smart ecosystem. Google is currently offering savings of up to 42 per cent on its two display-less smart speakers, the Google Home and Google Home Mini. 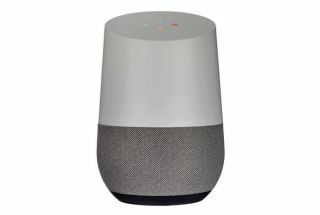 The Google Home – now just £69/$99, down from £120/$129 – is the larger of the two, offering users a whole host of music streaming services - all voice-controllable via Google Assistant. Other smart home devices in the Google Assistant ecosystem can also be connected and controlled by the Home. Its compatibility with Google Chromecast devices, both audio and video, gives voice control of Chromecast-equipped audio systems too, and also allows use of voice commands to Chromecast from YouTube and Netflix to your TV. We didn't find the Home's audio performance particularly convincing at its original price tag, but its current £69 sale price certainly softens that blow for those who are first and foremost after a smart speaker for its smart, rather than sonic, capabilities. The Google Home Mini – now just £29/$39 – is essentially just a dinkier version. To that end, it comes with Google Assistant and can be used purely as a wireless speaker, or as a smart hub through which you can control other Google Home or Chromecast-enabled speakers around your house.